WHAT THE HECK IS GAMELAN ANYWAY? ‘Gamelan’ refers to the Balinese traditional percussion orchestra and to the music performed on it. Closely related to Javanese gamelan, an older form, scholars speculate that the Balinese ensemble of bronze gongs, bamboo flutes and tuned keys has been played for at least a millennium on the island. Balinese artists developed a new form of music and dance in the early decades of the twentieth century, renowned for its dynamic, virtuosic group performance techniques, complexity and expression. Called kebyar (“explosion”), the form quickly became the most popular music on the island, with hundreds of villages developing their own gamelan gong kebyar ensembles; intense competitions between kebyar ensembles remain a major element of Balinese musical culture. Gong Kebyar is but one of the many types of Balinese gamelan, and music-making contexts in Bali range from temple festivals and family ceremonies to public competitions and tourist entertainment. It originated on the islands of Java and Bali in the Indonesian archipelago over a millennia ago. It still flourishes today and has spread globally – to as far away as New York City! WHERE CAN I FIND OUT MORE ABOUT BALINESE MUSIC AND DANCE? Bandem, I Made, and Frederik Eugene deBoer. 1995. Balinese Dance in Transition: Kaja and Kelod. Kuala Lumpur: Oxford University Press. Dibia, I Wayan, and Rucina Ballinger. 2004. Balinese Dance, Drama and Music: A Guide to the Performing Arts of Bali. Singapore: Periplus Editions. Gold, Lisa. 2005. Music in Bali: Experiencing Music, Expressing Culture. New York: Oxford University Press. Herbst, Edward. 1997. Voices in Bali: Energies and Perceptions in Vocal Music and Dance Theater. With a foreword by Judith Becker and an afterword by René T.A. Lysloff. Hanover, NH: University Press of New England. Heimarck, Brita Renée. 2003. Balinese Discourses on Music and Modernization: Village Voices and Urban Views. New York: Routledge. Tenzer, Michael. 1998. Balinese Music. Berkeley: Periplus Editions. Tenzer, Michael. 2000. Gamelan Gong Kebyar: The Art of Twentieth-Century Balinese Music. Chicago: University of Chicago Press. SOMETIMES THERE ARE QUITE A FEW OF YOU PERFORMING ON MANY INSTRUMENTS AND OTHER TIMES THERE ARE AS LITTLE AS TWO TO FOUR PERFORMERS. WHAT'S THE DIFFERENCE? The GENDER WAYANG, a five-tone ensemble that traditionally accompanies Balinese life-cycle ceremonies and shadow theatre. Its music is appropriately varied in character and mood. Played with one mallet in each hand (and thereby requiring the use of both wrists for dampening), the gender is one of the most challenging Balinese instruments to learn and master. Gender wayang ensembles can come in three sizes: 2 players, 4 players, and 8-10 players (four gender plus rhythm section, called batel). HOW DO YOU LEARN TO PLAY GAMELAN? 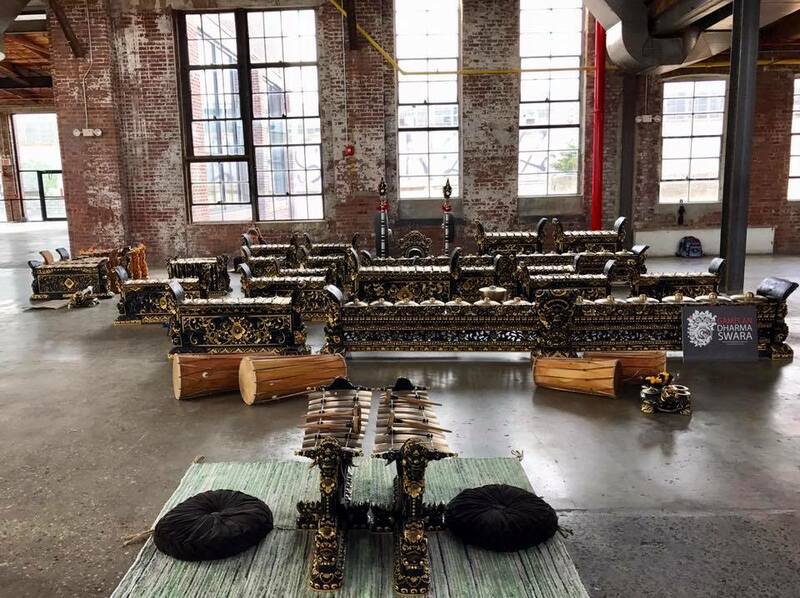 Our Balinese artists and acting directors teach gamelan using primarily traditional oral/aural methods. When learning traditional pieces, we do not use notation, and the extended and intricate patterns of Balinese music are learned over long periods of rehearsal involving imitation and repetition. This learning method can strike some western-trained musicians as overwhelming or difficult, but we believe that the intense investment in group process helps our members develop their memories (musical and otherwise), increases their rhythmic precision, and helps them play with a sense of ensemble beyond that which they have previously known. CAN I PLAY GAMELAN WITH YOU? We hold public workshops a couple of times a year during which you can try your hand at playing some of the instruments or experience some basic dance styles. These are the perfect opportunities to find out more about our organization and rehearsals. Also, don’t be shy about approaching us at a performance. We often hold mini workshops or at least an opportunity for folks to come and chat with us about the instruments after a show. Our workshops and performances are listed here on the website, but you can also sign up for our newsletters which will keep you up to date of all our happenings. And as always, you can always drop us a line here at any time.